Default Cost Group: Attach the Cost group here. Allow Reservation: Indicate whether to include this subinventory when you perform available-to-reserve calculations. Nettable: Indicate whether the planning process uses the on-hand balance of these subinventory items as available inventory. Quantity Tracked: Indicate whether each transaction for this subinventory updates the quantity on hand for the subinventory. Note: If you leave this option unchecked, on-hand balances are not maintained and you cannot check or update the Asset Inventory, Include in ATP, Reservable, or Nettable options. You can update this value only if there is no on-hand quantity for the subinventory. Asset Subinventory: Indicate whether to maintain the value of this subinventory on the balance sheet. 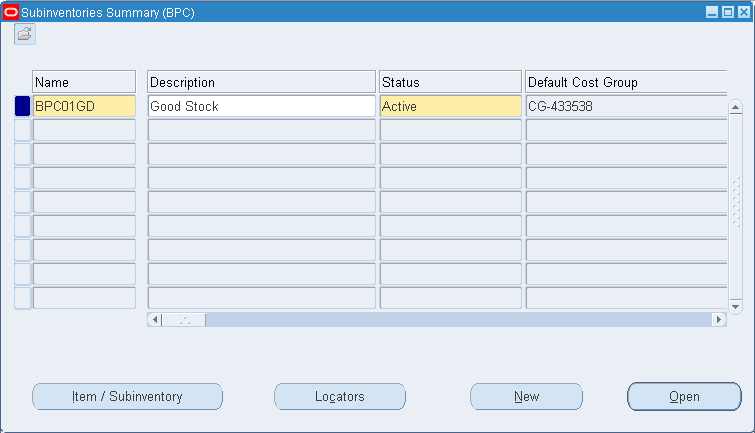 You can select an option only if you selected locator control as Determined at subinventory level in the Locator Control field in the Organization Parameters window. You can only update this option if there is no on-hand quantity for the subinventory. None: Inventory transactions within this subinventory do not require locator information. Prespecified: Inventory transactions within this subinventory require you to enter a valid predefined locator for each item. Dynamic entry: Inventory transactions within this subinventory require you to enter a locator for each item. You may choose a valid predefined locator, or define a locator dynamically at the time of transaction. Item level: Inventory transactions use locator control information that you define at the item level. 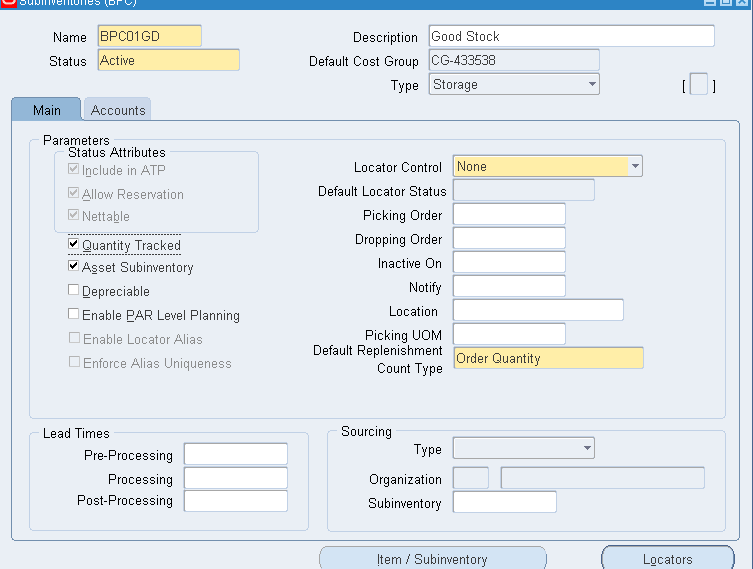 Picking Order: This value indicates the priority with which items can be picked from this subinventory, relative to another subinventory, where a given item resides. Dropping Order: This value indicates the priority with which items can be dropped to this subinventory, relative to another subinventory at the time of receipt. Inactive On: Enter the date, if you want this subinventory to inactivate. Optionally, enter pre-processing, processing, and post-processing lead times for items in this subinventory. These lead times are used when you use min-max planning at the subinventory level. Inventory: Replenish items internally, from another subinventory in the same organization or another organization. Supplier: Replenish items externally, from a supplier you specify in Oracle Purchasing. Subinventory: Replenish items internally from this subinventory. Enter all General Ledger accounts as defined in the system as per the business requirement. Save your job. This will create a subinventory. 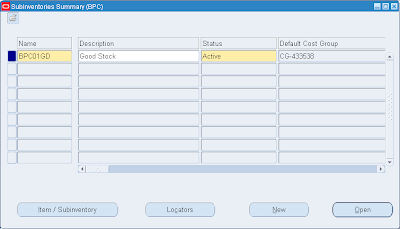 Enter a general ledger account to accumulate material costs for items received into this subinventory. This is usually an asset account used for the value of goods stored in this subinventory. 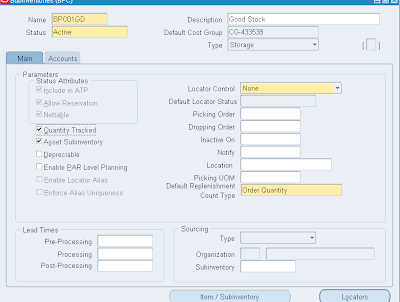 For asset items, you use this account as a default when you generate purchase requisitions from MRP, min-max organization level planning, or reorder point planning. However, when you receive the purchase order, you use the appropriate valuation or expense account. Enter a general ledger account to accumulate outside processing costs for this subinventory. This is usually an asset account. Oracle Work in Process charges this account at standard cost when you receive items for a job or schedule in Oracle Purchasing. Oracle Work in Process relieves this account at standard cost when you issue components to a job or schedule. Enter a general ledger account to accumulate material overhead or burden costs for this subinventory. This is usually an asset account. Enter a general ledger account to accumulate resource or department overhead costs for this subinventory. This is usually an asset account. Oracle Work in Process charges this account at standard cost when you complete assemblies from a job or schedule. Oracle Work in Process relieves this account at standard when you issue components to a job or schedule. Enter a general ledger account to accumulate resource costs for this subinventory. This is usually an asset account. Oracle Work in Process charges this account at standard cost when you complete assemblies from a job or schedule. Oracle Work in Process relieves this account at standard cost when you issue components to a job or schedule. Enter a general ledger account to accumulate expenses for this subinventory. For expense subinventories, this account is charged when you receive any item. For asset subinventories, this account is charged when you receive an expense item. Enter a general ledger account to hold the value of encumbrances against items in this subinventory. This account is used for purchase order receipts and returns.